Pending a few more black and white images still to be taken, the New Horizons odyssey to Pluto is done. It may still have work to do in the Kuiper Belt, but that has not yet been decided. In the center left of Pluto’s vast heart-shaped feature – informally named “Tombaugh Regio” – lies a vast, craterless plain that appears to be no more than 100 million years old, and is possibly still being shaped by geologic processes. This frozen region is north of Pluto’s icy mountains and has been informally named Sputnik Planum (Sputnik Plain), after Earth’s first artificial satellite. The surface appears to be divided into irregularly-shaped segments that are ringed by narrow troughs. Features that appear to be groups of mounds and fields of small pits are also visible. The blocky appearance of some features is due to compression of the image. You can view a simulation of the flyover here created from the closest-approach images. There’s also an amazingly detailed picture of the mountains at the equator. 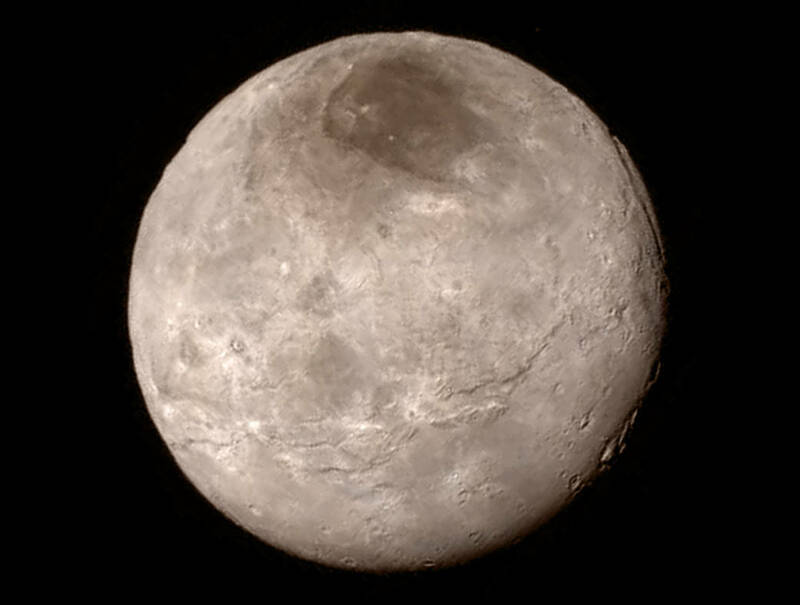 There are also new pictures of Charon, Pluto’s moon. You can sign the petition here, if you want. I’m still not sure if I am going to, because I don’t think this is the right way to promote science literacy. Perhaps I am wrong, and perhaps I am a cranky curmudgeon. Maybe just getting people to be excited about science is the right way to start. After all, all it took for me as a small child was the shiny photographs in Time Life’s glossy coffee table books on space and the planets, I cared nothing for the scientific method then. As a last note, don’t miss NASA’s hour long documentary The Year of Pluto. This entry was written by whyevolutionistrue and posted on July 19, 2015 at 12:47 pm and filed under science literacy, space exploration with tags New Horizons, Pluto. Bookmark the permalink. Follow any comments here with the RSS feed for this post. Both comments and trackbacks are currently closed. Perhaps we should start a petition to reinstate bonobos as full-fledged members of Pan troglodytes. That makes about as much sense as reinstating Pluto as a planet rather than one of these. Science advances. Sometimes what we thought we knew turns out to be not quite right. Deal with it. Perhaps the problem is treating “planet” as a binary measurement; maybe each heavenly body should have degrees of planetness. Pluto would be a .7. Well the 0.7 is a bit tongue in cheek but I find nothing wrong with the idea of a planet categorization system given that we categorize stars. Call the gas giants Type I, the ice giants type II, the rocky spherical worlds in stable cleared orbits Type III, and the rocky spherical worlds in oblique or non-cleared orbits Type IV. So, Jupiter and Saturn are type I planets, Uranus and Neptune are type II planets, Earth Mercury Mars and Venus are type III planets, and Pluto Ceres and a bunch of others are Type IV planets. What you’re calling Type IV planets are what the IAU calls dwarf planets. So basically what you’re proposing is to get rid of the descriptive category names (“gas giant”, “ice giant”, “terrestrial”, “dwarf”) and replace them with inscrutable Roman numerals. I don’t see how that’s an improvement. Not replace, any more than having star categories replaces the names ‘white dwarf,’ ‘red giant,’ etc. ; you can have both categories and names, scientists use both perfectly fluently in the case of stars. What my categories are intended to do is resolve the ‘whats a planet’ argument by recognizing that the differences between Jupiter, Earth, Pluto, and Ceres (etc.) are better represented via a scale than they are a binary yes/no categorization. Do you mean a scale in the quantitative sense, as in the Richter scale of earthquake energy, or the Moh scale of mineral hardness? If so, what quantity are you proposing as the basis for your non-binary scale of “planetness”? Gas giants (what I’m proposing as a Type I planet) meets conditions a-e. A type II ice giant meets conditions a-d. A type III rocky world meets conditions a-c. Pluto and Ceres (type IV) meets a-b. Comets meet condition a so maybe they get classified as a type V.
That makes some sense. But I suspect that as the catalog of extrasolar planetary systems continues to grow, we’ll find more and more cases that don’t fit neatly into that hierarchy. We already know of a couple of probable gas dwarfs that satisfy b, c, and e but not d. Even in our own solar system we have numerous objects that satisfy b and c but not a, several of them larger than anything in your Type IV. At the time of the Plutonian “demotion” (reclassification) I was a sometime contributor to Phil Plait’s site. I asked him and the other astronomers whether there would be any use to having some notion of degrees of planethood, and he thought not. I’ll be interested in knowing whether a U.S. ideologue/politico has a problem with naming a physical feature of Pluto “Sputnik Planum,” this being a U.S.-funded mission. There’s at least one naysayer/complainer letter writer in the NY Times, saying to the effect that the $750M would be better spent on Earthbound problems-related research. No doubt he is perfectly qualified to specify and prioritize that research. But I’ve yet to hear any such complainer actually so specify. Surely there will be such an idiot, it is only a question of time. Speaking of the Pluto evangelists in this context, these classifications are man made. The astronomical planet definition has nothing to do with Stern’s planetary scientist definition, where “planet” is mostly the group of objects under study – comets have atmospheres too, say. Maybe the astronomers should retreat their definitions and let the planetary scientists make them, but that situation is not at hand. And while one can have a discussion of the usefulness of classifications when concerns like history and emotions appears strong, it should be a generic discussion. I had heard that the whole vote was done by astronomers w/o planetary scientists in attendance. In any case, I think they got it right. I favor the idea that the ‘geology’ on Pluto is mainly convection currents from different kinds of frozen gases and ice. The term ‘geology’ seems odd to me, but I probably should get used to it. Perhaps their are tidal forces from Charon that are slowly pushing this material around on Pluto, creating renewing its surface and causing the terrain that we see. Pluto and other such objects in this region may be basically really big round comets. Neil DeGrasse Tyson had pointed out that if one were to drag Pluto in closer to the sun that it would sprout a comet tail. I’ve been trying to come up with a hypothesis for Sputnik Planum that doesn’t rely on ‘geologic’ processes or convection currents in solids. Pluto has a very eccentric orbit. Its perihelion is within the orbit of Neptune, and the last perihelion was in 1989. Sputnik Plenum is almost in the centre of the daylight side, and presumably it would have been in the centre of it too at some part of the Pluto day at perihelion. And it would be warmer there too at some part of the day. The maximum average temperature of Pluto is close to the melting point of nitrogen ice. If the temperature is high enough at Sputnik Plenum, perhaps the nitrogen ice melted at perihelion. And if liquid nitrogen is similar to water in that its albedo decreases over the solid, the the liquid would absorb more solar heat and boil. Nitrogen has the interesting property that as it boils, it also freezes (boiling liquids lose heat, dropping the temperature, and the boiling and melting points are so close together with nitrogen), first forming an amorphous solid which immediately undergoes explosive crystallisation forming the more stable nitrogen ‘snow’, so the pavement tile appearance is a result of explosive crystallisation, not convection. And if fresh nitrogen snow is similar to fresh water snow, it has a higher albedo than nitrogen ice and doesn’t remelt and the pavement appearance persists past perihelion. I know it’s all conjectural and probably not the true explanation. But one of the reasons given for this mission was that Kuiper belt bodies are so cold that they reflect the composition of the early solar system – they’ve been in the deep freeze for the past 4.5 billion years – which certainly doesn’t apply to Pluto with its eccentric orbit. That sounds really good, and even better news is that I understand most of it. Unfortunately, Pluto and Charon rotate with a period of about 6.3 (Earth) days, while the observed arc over perihelion has lasted between 1 and 2 thousand rotations. Over perihelion, illumination has varied more strongly with latitude than longitude. Sorry, but your model doesn’t work. Whatever causes these longitude-wise variations in surface properties, it isn’t relative illumination. I put my hypothesis out as a suggestion to see if anyone could pick holes in it. Your comment about latitude and longitude is a good one. Pluto’s axis is tilted at about 117 degrees to its orbit, so one of its poles should be pointing directly at the Sun at some point of its orbit. And if it’s at perihelion, then that would amplify the heating at one point – somewhere close to a pole. I just don’t know if that’s the case. My hypothesis, for it to be plausible, needs 1. Enough nitrogen ice. 2. One location on Pluto to be directly under the Sun (or rather the Sun is directly overhead) for a longish period at perihelion because one of the poles is more or less directly pointing towards the Sun at that time. 3. The local temperature is raised above the melting point of nitrogen ice. 4. Liquid nitrogen has a lower albedo than nitrogen ice, and absorbs more heat than ice, and warms further 5. Freshly formed nitrogen snow has a higher albedo than nitrogen ice, and absorbs less heat, and as a result cools. I’m assuming that as nitrogen ice melts, it forms discrete pools of liquid nitrogen, which then simultaneously boil and freeze, followed by explosive crystallisation throwing out nitrogen snow producing a pavement appearance (there are impressive YouTube videos showing this happening in liquid nitrogen as pressure is reduced in a vacuum container – which drops its boiling temperature). 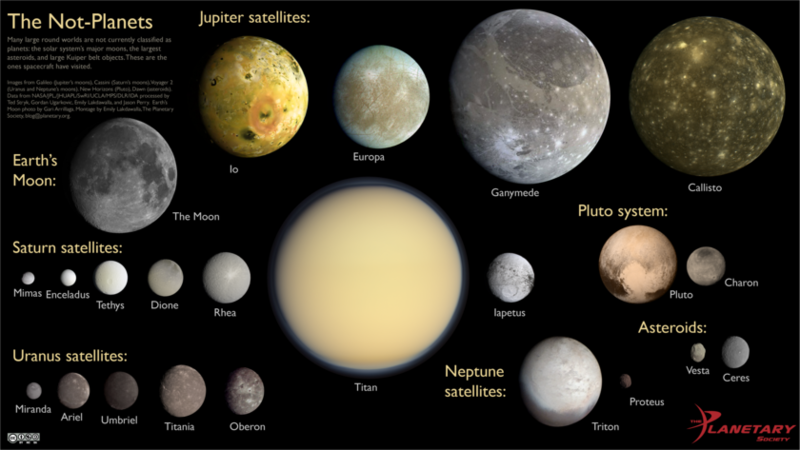 I’d expect Sputnik Plenum to be near one of Pluto’s poles. Which would be consistent with the appearance of the orbit of Charon, tracing a circle around Pluto, following its equator, if it formed in the same way as the Moon did, as a low velocity collision between two substantial bodies. I’m making a lot of assumptions which just might not be true. And further images might blow my hypothesis out of the water. Hmmm, I’m getting the general gist of your consideration of the axial tilt of Pluto being a consideration. However, from about 1982 to the mid-1990s Pluto and Charon went through a series of mutual occultations as seen from Earth. So the axes of all three bodies were pretty close to perpendicular to the body-Sun line in the late 1980s. So (eyes glaze ; fingers twitch), the poles are oriented about 60 degrees to the body-Sun line at the moment. It might be a consideration at some points of the orbit, but not at the moment. And of course, if Sputnik Plenum isn’t at a pole, then my hypothesis is dead. If it is, it need not have formed at the last perihelion. It could have formed at the previous one or two. Sputnik Planum is NOT near the pole, it roughly straddles the equator. Turns out (sorry, I didn’t save the link) that perihelion and aphelion for Pluto-Charon are also times that the system presents it’s equatorial aspect towards Sol. I thought on that for a few seconds. I can tell a story why that isn’t surprising. I leave the activity as an exercise. Pluto and Charon are dually-synchronous, where the Earth-Moon system is only synchronous of the Moon’s rotation to to it’s orbit around the Earth. Viz, while the Earth stays in (about) the same location in the sky seen from a general point on the Moon’s surface, from a general point on the Earth’s surface the Moon continues to move. Movement like that is needed to generate tidal forces moving angular momentum between the whole rotating planetary system and the axial rotation of one of the couple. Tidally, the system is almost dead. Regarding Pluto’s status as a planet, the problem is that the definition the IAU foisted upon the world (despite not having any actual authority to do so – they get to name objects, not classify them) is garbage. There’s no sensible definition of planet that includes Pluto but excludes other large KBO objects. But there’s also no sensible definition that excludes Pluto and includes the pre-1900 eight. Put another way, the current IAU attempt at a definition is not scientific, but merely an attempt to include classic planets and the two ice giants but exclude everything else. So yes, Pluto is a planet. So is Ceres, and a host of other objects further out than Pluto. That’s a respectable position, but it doesn’t seem to be what the petitioners are asking for. They want their “beloved” Pluto gerrymandered back into the family of nine they remember from their childhood. It’s about nostalgia, not science. The discovery of other large Kuiper belt bodies meant, by extrapolation of the very large space, that there will be a lot of other such bodies out there. This made it necessary to re-think what a planet was since if Pluto was a planet then we would have maybe high dozens or even hundreds more such planets along a continuum of sizes. Where do we draw the line? I think the term ‘planet’ needs to be somewhat special. The term dwarf planet is ok by me. Maybe they went about it in a problematical way, but the conclusion was right, IMO. Or perhaps “honorary planet.” We have to think of Pluto’s dignity. I’m not sure there was a ‘necessity’ to rethink the definition. Its not like memorizing the names of every celestial body named ‘planet’ is a critical educational endeavor. If we had gone with a definition that included tens or hundreds of celestial bodies, then the textbooks would’ve simply been modified to say “there are many planets, but the 9 most massive are…” or “..but the 8 referred to historically as planets were…” and that would be it. Maybe Ceres would’ve gotten an extra paragraph or two, but I doubt any definition would have significantly changed the content of middle- and junior high astronomy units. I’m not as extreme as Thanny. The criteria of ‘clearing the orbit’ was obviously added post-hoc to produce the result of a small number of things called planets, but I wouldn’t call it “not sensible.” Just a matter of preference. FYI, “the 9 most massive” would still not include Pluto. Eris is heavier. We draw the line at a sensible definition. There probably are dozens, maybe hundreds, of bodies properly classified as planets. Keeping the list small is not a valid criterion. If the IAU does not have the authority to classify, who does? It is a pathetic argument to say that the largest organization of professional astronomers cannot classify astronomical objects. It’s just Pluto lovers who would even venture such an argument. The IAU’s definition makes a lot of sense. The eight planets have cleared their orbit of any substantial debris and/or rival, 134340-Pluto has not. Neither has 1-Ceres, 136199-Eris, 4-Vesta, 136108-Haumea, 136472-Makemake, 50000-Quaoar, 90377-Sedna, etc. Pluto is a Kuiper Belt object. Avery interesting one, but still a KBO. Nothing but nostalgia, certainly no scientific arguments, is pushing it back to planethood. Classification of astronomical objects, like all other science, is not done by committee. It’s not the kind of thing anyone has the authority to do. It’s a matter for scientific consensus, which the IAU’s assertion bears no relation to – they actively avoided trying to achieve any kind of consensus. And the “cleared orbit” requirement is the nonsensical part of the definition. It’s temporal in nature, such that what is a planet now would not have been a planet in the past due to not having yet “cleared its orbit”, and may in the future cease being a planet due to the introduction of new interlopers in its orbit that it has to clear (something taking centuries or millennia) before regaining planetary status. Any sensible definition of what a planet is must consider its physical nature and orbital status with respect to its parent star(s). A simple example of a workable definition is any celestial body with enough mass to become rounded by gravity and too little mass to undergo fusion at its core, and which does not orbit any barycenter below the surface of another body other than one of its parent stars. Only extreme events could change a body’s status under that definition, such as capture and ejection. I’m curious why you feel that orbital status is a non-negotiable requirement. There are more than a dozen planetary satellites larger than Ceres, some with atmospheres and/or oceans. Why must “any sensible definition of what a planet is” exclude them? Also, I don’t think it’s the case that only extreme events could change a body’s status under your barycenter criterion. It seems possible that the transfer of angular momentum due to tidal forces could eventually enlarge a satellite’s orbit enough to lift the barycenter out of the companion body’s interior. At that point the former satellite would become a planet under your definition. The only requirement I made is that the body have an orbital status, which every object in the universe does necessarily. So if it’s “non-negotiable”, you can blame gravity. I exclude planetary satellites in my example simply because we already have an established name for such bodies – moons. I can’t think of a good reason to abandon that concept, though I’m not dead set against it for bodies which would otherwise be planets (due to gravitational rounding, a characteristic most everyone agrees on). And yes, if a moon is massive enough and drifts far away enough to move the barycenter outside the planet it’s orbiting, then it becomes a planet. That certainly qualifies as an extreme event. Ironically, my example is actually what the IAU originally proposed around 2006. It’s obvious the unstable definition that they ultimately went with was explicitly designed solely to avoid adding new planets to the roster, which is an unscientific motivation. From under my geologist’s hat, I’m cool with Pluto, Ceres, Vesta (marginally), Eris, and a considerable number of other KBOs all have the characteristic of being near spherical under self-gravity. That is a relationship between the intrinsic properties of the objects (composition, mass, surface and internal gravity) without reference to their external circumstances. The same criterion could be unambiguously applied to an object in a z>4 galaxy with the same results. 9 planets? There have never been nine planets in the Solar System. Outside text books. To have craters, you need projectiles that can cause the craters. Unless KBO’s migrated from the inner Solar System and experienced part of the bombardment, I would expect there to be minimal craterization out where Pluto is–there just ain’t the ammo/cubic space to create the craters. True, there may be millions of KBO’s and pieces of debris out there, but all of that is in a much, much greater volume, respectively, than the volume that held the bombardment meteors of the inner Solar System. I just looked up the Neptunian moons and while the images for many are fuzzy, those that are clear do not show the bombardment-type of surface you see on Mercury, the Moon, Mars, etc. I’m not an expert, but it appears that the total mass of the Kuiper belt is on the order of 100 times larger than that of the asteroid belt. So although the volume is much larger, there’s also a lot more stuff flying around in it. Moreover, since Pluto’s orbit is in 3:2 resonance with Neptune, we can expect the density of KB mass in Pluto’s vicinity to be higher than the KB average. Is there an expert in the house to whom we can pose the question? I’m just curious. I can generally answer questions about craters. To form a “double planet” without a “giant impact,” you probably need a triple encounter between the two components that will become the double planet, and a third substantial body (compared to the other two) which can collect a good chunk of the kinetic energy and angular momentum of the initial system and take it away. Without that third body, your system will have so much energy and angular momentum as to be very unstable. The probability of triple encounters depends even more steeply on the particle density than the probability of double encounters (collisions). Oh yeah, another point : because the Kuiper belt is somewhat controlled by being constrained near the ecliptic, whereas the Oort cloud is more spherically symmetrical. So the density of particles in the KBO varies more similarly to 1/r^2 while in the Oort cloud it will vary more like 1/r^3. My thanks to all that replied! The asteroid belt is a ring from approximately 2 AU-3.2 AU, so it has an area of about 19.6 AU^2. The Kuiper belt is a ring from approximately 30 AU to 50 AU, so has an area of about 4398 AU^2. This means the Kuiper belt contains about 224x the square footage of the asteroid belt. If there’s 100x more material in it, it’s still actually half as dense. However I should point out that the Wikipedia entry on the Kuiper belt mentions that it could have up to 200x the mass of the asteroid belt, which would put them on par in terms of overall density. What I found more interesting was that wiki says the total mass in the Kuiper belt is expected to be no more than 1/10th the mass of the Earth. However Pluto is only about 0.2% of the Earth’s mass, and Eris etc. are much smaller. So that means there could be a lot more large KPOs out there, beyond the 8-10 we’ve already discovered and named. OK, but just a polite correction will be more than sufficient here. It’s not entirely a correction. What was stated is technically correct. It’s an acknowledgement of what’s left to come, versus thinking that the whole thing is over. Sputnik would be so proud. Not a planet. Unless you think QM and wave phenomena are not the only places in science where incoherence makes sense.